Bomas of Kenya is miniature replica of Kenyaâ€™s diverse cultures. It allows visitors to experience the wide array of Kenyan people and their way of life. The term Bomas, meaning "homesteads", which are displayed on the site. Each represents one of Kenya's major ethnic groups, and is built to the original traditional architecture of an African home as built by the ancestors. Bomas of Kenya was established in 1971 under the auspices of Kenya Tourist Development Corporation (K.T.D.C). It mandates were to preserve, maintain and promote rich and diverse cultural values of various groups of Kenya, and to act as a tourist attraction center. Different aspects of Kenyan culture are displayed that include living styles, crafts, music and dancing. 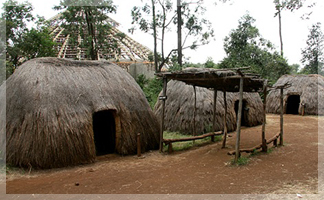 Visitors can view traditional villages representing the lifestyle of ethnic groups such as Kikuyu, Kalenjin, Luhya, Taita, Embu, Maasai, Kamba, Kisii, Kuria, Mijikenda and Luo. The Bomas' world famous Harambee dancers perform daily in a unique spectacular theater, the biggest in Africa which seats 3,500 people. Dancers representing different ethnic tribes dance across the stage in a vibrant kaleidoscope rhythm and hue. Proud Samburu warriors vault skywards as they woo their maidens with chanting cries and twirling spears. 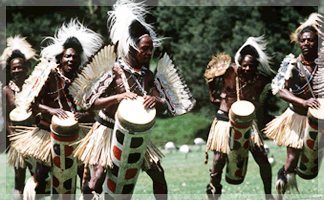 Bomas of Kenya has over 30 traditional dances collected from different tribes of Kenya. 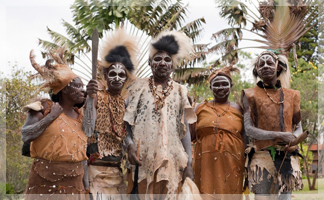 The Luo (also Lwo) are an ethnic group who live in an area that stretches from the south of Sudan, through Northern Uganda and Eastern Congo(DRC), into Western Kenya, and ending in the upper tip of Tanzania. According to ethnologists, linguists and oral history, the Luo are part of the Nilotic group of tribes who separated from the East Sudanic family of tribes about 3000 BC. More than eight centuries ago, the Luo people occupied the area that now lies in eastern Bahrel el Ghazal. The reason for their dispersion from this area is not known. Internal contradictions or population explosion could driven them from this region. The Luo moved to nearly all the countries neighbouring Sudan, resulting in many separate groups with variation in language and tradition as each group moved further away from their kin. A branch of the Luo, the Shilluk (or Chollo) nation, comprising more than one hundred clans and sub-tribes, was founded by Nyikango sometime in the middle of the 15th century. They evolved a nation with a feudal-style system. Nyikango and his nation moved northward along the Nile (towards Kush and Rip) to re-conquer and settle the land their ancestors had lost to the Arabs and Europeans. The rest of the Luo groups rejected Nyikangos idea and kept a south and westwards migration. The Luo in Kenya , who call themselves JoLuo (aka Jaluo, people of Luo), are the third largest community in Kenya after the Kikuyu and Luhya. They call their language Dhaluo, which is mutually intelligible the languages of the Lango, Kumam and Padhola of Uganda, Acholi of Uganda and Sudan and Alur of Uganda and Congo. They mostly reside along the shores of Lake Victoria, with their chief economic activities being fishing and farming. d 4,000 people. The Kikuyu (otherwise spelled G?k?y?) ethnic group is Kenya's most populous ethnic group. They cultivate the fertile central highlands and are also the most economically active ethnic group in Kenya. Although uncertain, ethnologists believe the Kikuyu came to Kenya from West Africa (present day Cameroon) together with the other Bantu tribes. On reaching what is now Tanzania, they moved east past Mt. Kilimanjaro and into Kenya finally settling around Mt. Kenya while the rest of the group continued migrating to Southern Africa (to become present-day Zulus, Shonas, etc.) They were originally hunter-gatherers but unlike the Nilotic tribes who were pasoralists, they began farming the very fertile volcanic land around Mt. Kenya and the Aberdare Ranges. Kikuyu speak Gikuyu, a Bantu language, as their native tongue. Additionally, many speak Swahili and English as well, the official languages of Kenya. The Kikuyu religion is monotheistic. According to legend, Ngai (the creator worshipped also by the Maasai and Kamba), resides atop Kirinyaga, known as Mount Kenya. Although conflicting stories exist, 'Kirinyaga' means "mountain of brightness" in G?k?y?. British colonialists misinterpreted the name to give the present name, Kenya. In tradition, Ngai created the land and gave it to the people creating an irrevocable bond between man and land. Other important aspects of tradition include the value of ancestry and the forest. In present day, 73% are claimed to be Christian, but traditional beliefs are often retained. Many Kikuyu have moved from Kikuyuland to other parts of the world through intermarriages, business opportunities, fields of study, seeking better prospects in life, etc. Those living in rural areas tend to continue to practice farming. Many Kikuyu have, however, moved to the cities to find jobs. The Kamba people (Wakamba) are a Bantu people who live in the semi-arid Eastern Province of Kenya stretching east from Nairobi to Tsavo and north up to Embu, Kenya. This land is called Ukambani or land of the Kambas. Depending on the source, they are either the third or the fifth largest ethnic group in Kenya. They speak the Kikamba language. The Kamba moved into their present lands over centuries of migrations from lands to the south. As they settled in hilly lands their population increased. Trade with the Kikuyu was also practiced by the Kamba of the dry lowlands. Trade was in the form of barter of locally-produced goods like medicinal charms (magini), beer, tools and weapons for food from the highlands. This existing trade network was adopted by ivory traders in the 18th century and 19th century. Like the Maasai and Kikuyu, the Kamba believe in a monotheistic God called Ngai. The Kamba acted as middlemen between the coastal Arab Swahili traders and the upcountry tribes. Their trade and travel made them ideal guides for the caravans gathering slaves for the Middle East and Indian markets. Early European explorers also used them as guides in their expeditions to explore East Africa. The Kamba resistance to colonialism was mostly non-violent in nature. Family plays an important part in Kamba culture. The mother or grandmother is usually called Mwaitu. Naming is an imprtant aspect of kamba people. Children are often affectionately called Musumbi (meaning "king"), and Muthoki (meaning "long awaited one"). Kamba children are named for to time or events surrounding their birth. For example, Nduku is a name given to a baby girl born at night and Mutuku to a baby boy born at night. Children born when it is raining may be named Mbua (feminine) or Wambua (masculine). The Maasai or Masai, an indigenous African tribe of semi-nomadic people located in Kenya and northern Tanzania, are probably one of the most familiar tribes of East Africa. Despite the growth of modern civilization, the Maasai have largely managed to maintain their traditional ways, although this becomes more challenging each year. The Maasai are part of the Niloticfamily of African tribal groups, and probably migrated from the Nile valley in Sudan to central and south-western Kenya and northern Tanzania sometime after 1500 AD, bringing their domesticated cattle with them. The Maasai speak the Maasai language, an Eastern Nilotic language closely related to Samburu (or Sampur), the language of the Samburu people of central Kenya, and to Camus spoken south and southeast of Lake Baringo (sometimes regarded a dialect of Samburu). The Maasai, Samburu and Camus people are historically related and all refer to their language as ?l Maa, although they acknowledge mutual cultural and economic differences. Most Maasai also speak Swahili, the lingua franca of East Africa. The ability to graze their cattle over large territories has diminished considerably in recent years, due to increased urbanisation and the declaration of the Maasai Mara and Serengeti game reserves, which was all formerly Maasai grazing land.Despite their reputation as fierce warriors, Maasai culture revolves around their cattle. One of their spiritual beliefs is that their rain god Ngai gave all cattle to the Maasai people, and therefore anyone else who possesses cattle must have stolen them from the Maasai. This has led to some fatal altercations with other tribes of the regions over the centuries when the Maasai attempt to reclaim their "property". The huts of the Maasai are built from dried cattle dung, and certain sacred rituals involve the drinking of cow blood. 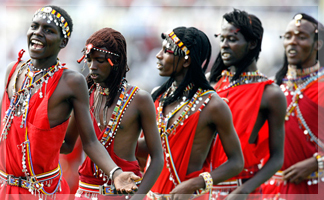 There are numerous traditions and ceremonies performed by Maasai men. Perhaps best known is the warrior "jumping" dance, where young Maasai morani (warrior-youth) leap into the air from a standing position, in order to demonstrate their strength and agility. Until recent times, in order to earn the right to have a wife, a Maasai moran was required to have killed a lion. Officially this practice has stopped, although there is evidence that it continues in the more remote regions of Kenya. Also in earlier times a group of young boys were required to build a new village and live in it for a lengthy period (often years) as part of the passage to manhood. This practice is dying out due to lack of land.